Delicate creamy white flower clusters handmade in resin have been set upon a pair of silver plated posts (no nickel) in this pair of handmade flower earrings earrings that are finished with matching silver plated earring backs. Purple Flower Cluster Earrings. Purple Flower Earrings. Silver Post Earrings. Stud Earrings. Flower Jewelry. Handmade Jewelry. Turquoise Flower Cluster Earrings. Turquoise Flower Earrings. Silver Post Earrings. Stud Earrings. Flower Jewelry. Handmade Jewelry. Excellent!! Loved it!! Thanks much! Red Flower Cluster Earrings. Red Flower Earrings. Silver Post Earrings. Red Earrings. Stud Earrings. Flower Jewelry. Handmade Jewelry. Ivory Flower Cluster Earrings. 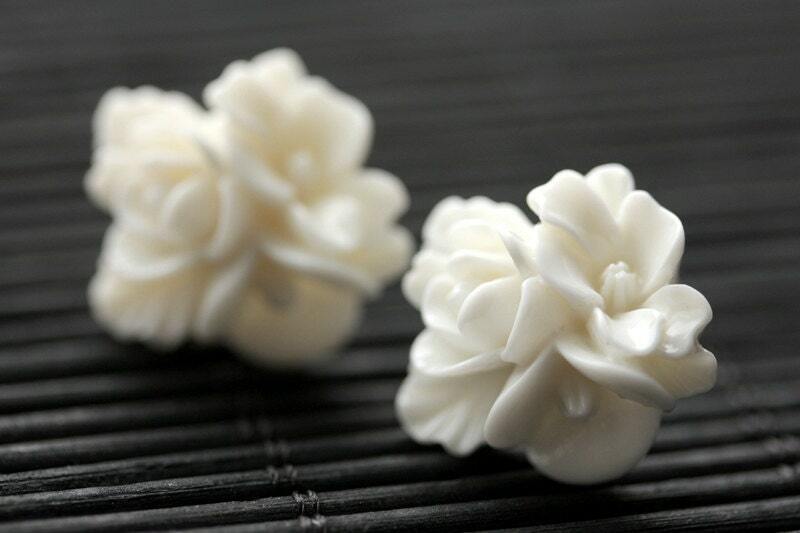 Ivory Flower Earrings. Bronze Post Earrings. Stud Earrings. Flower Jewelry. Handmade Jewelry. Gray Flower Cluster Earrings. Grey Flower Earrings. Silver Post Earrings. Stud Earrings. Flower Jewelry. Handmade Jewelry. Coral Pink Flower Cluster Earrings. Flower Earrings. Silver Post Earrings. Pink Earrings. Stud Earrings. Flower Jewelry. Handmade Jewelry. Flower Earrings. White Flower Earrings. Daisy Flower Earrings. Silver Post Earrings. Stud Earrings. Flower Jewelry. Handmade Jewelry. Taupe Lotus Rose Earrings with Silver Stud Earrings. Flower Jewelry by StumblingOnSainthood. Handmade Jewelry.